"In the vast majority of patients who have stones in the gallbladder, the stones may not be causing the symptoms of the patient's illness." That somewhat surprising statement comes from Rakesh Gupta, M.D., internist / gastroenterologist. Dr. Gupta's comment is indicative of changes that have occurred over the past 10 years in the understanding of cholelithiasis and choledocholithiasis – a condition marked by the presence of calculi (stones) in the gallbladder and the common bile duct. This new understanding has led to a reconsideration of the best modes of treatment. Dr Gupta explains. "The incidence of prevalence of gallstones or gall bladder disease increases with age. It is thought that 10 percent of the adult population age 25 and over have stones, and this increases to one in four by the age of 70. "Furthermore, it is estimated that in up to 70 percent of patients who have gallstones, it may not be the gallstones themselves that are causing significant clinical illness. To best manage choledocholithiasis, we must look at the entire clinical picture in each individual case," Dr. Gupta says. "Unless it is really deficient, even bad bile won't necessarily cause the formation of stones if the flow is good and rapid. There may be a problem with the gallbladder itself," Dr. Gupta says. Why? The answer lies in the function of the gallbladder. "The gallbladder acts as a reservoir. Therefore, if the bile flows in, but not all of it flows out, theeffect becomes like that of a stagnating pool." 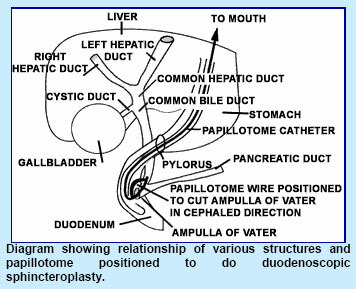 common bile duct. Normally, it assists in the bile regulation. "The papilla functions in a way similar to a valve. When it is operating normally, it opens up at the time we need bile and releases it into the duodenum to assist in digestion. Normally, it is synchronized with our eating and is controlled by the nervous system and hormones. "The papilla may become lacerated when stones pass through the opening. When the papilla heals, scar tissue forms. "The scar tissue may restrict the flow of bile to the point at which it is unable to move at normal pressure. The inability of bile to flow freely into the intestine can lead to the recurrence of stones – or merely a build-up of pressure in this channel that causes pain. "This explains why a patient who may have had the gallbladder removed can experience what seems to be a 'gallbladder attack", Dr. Gupta says. to remove the gallbladder," Dr. Gupta says. Why? "For the same reason that you would not want to keep a worn-out part in a new engine." Even in a case in which the stones are not causing the symptoms now, they may have a significant negative impact in years to come." "Therefore, it makes sense to remove the gallbladder while the patients is young, rather than wait until later when his risk factors have increased." "For older and / or high-risk patients, however, an endoscopic approach may be used. Called duodenoscopic sphincteroplasty, this approach has been developed only recently." The scope is flexible, with a light source at the tip that allows the gastroenterologist to view the papilla and see the scar tissue. The patient is sedated, and the scope is inserted through the mouth. "The scar tissue can be cut, through the scope, using an electric knife. If there are stones in the bile duct they can be pulled out using a balloon or basket inserted through the scope. "If there are no stones, you still make an incision to relieve the spasm in the muscle." "This procedure can be performed even if the gallbladder has been previously removed," Dr. Gupta says. He is quick to note that duodenoscopic sphincteroplasty is not for every patient. "For instance, the stones in the bile duct may be to large. Therefore, it may be necessary to use a solution to dissolve them or perhaps an open surgical procedure." "And often, stones are found to be secondary to a disease of the liver, pancreas, or other problem. Each patient is judged individually." Dr. Gupta stresses that this endoscopic technique cannot remove stones from within the gallbladder. "By using duodenoscopic sphincteroplasty, we are able to diagnose many people whom we couldn't diagnose in the past," he says. "Nowadays, if there is scar tissue present, regardless of whether there are stone in the bile duct, you can see it with the scope and surgically cut it. "Less hospitalization is required – usually one to three day's stay – and the procedure does not require general anesthesia." who are still experiencing pain – with a high success rate," Dr. Gupta says. "As for the future, the development of ultrasonic lithotripsy and laser probes in combination with duodenoscopic sphincteroplasty will further refine our abilities to handle most gallstone-related problems, " Dr. Gupta predicts. Duodenoscopic sphincteroplasty is performed in Saint Anthony Hospital's gastrointestinal laboratory. Dr. Gupta attended medical school in India. His internship was served at the Hospital for Joint Disease and Medical Center, New York City, where he trained for general surgery. His internal medicine residency was completed at Cook County Hospital, followed by a two-year fellowship in gastroenterology at the University of Illinois Hospital, Chicago. He is board-certified in internal medicine and gastroenterology and is a member of the American gastroenterology Association.